The Compendium of Birds (鳥譜, niaopu) is an important encyclopedia of bird species produced for the eighteenth-century Chinese court that has received little scholarly attention. Built upon a rich tradition of Chinese flower and bird painting and bestiaries but also in dialogue with early modern European natural histories, the book offers a glimpse into a Chinese court seeking to define itself in relation to both Chinese and European modes of describing and representing the natural world. In this essay, I will first examine the Manual, seeking to trace its production within the Qing court. Next, I will consider how this work relates to artistic and textual models in Chinese and European sources. Finally, I will show how the Compendium of Birds drew upon these traditions to create a unique and unified approach to representing the Qing empire within history, poetic imagination, and geographical space. The Compendium of Birds is a painted album that depicts 360 birds, each paired with a textual description. It was created by Jiang Tingxi 蔣廷錫 (1669-1733) for the Kangxi court but later copied by Zhang Weibang (張維邦, ca. 1725-1775) and Yu Sheng (余省, 1692-1767) at the direction of the Qianlong Emperor (r. 1736-1795). The book is notable for its ambitious size, meticulously accurate illustrations, and lengthy texts that combine dense historical references with rigorous mensuration and details gleaned from close observation. And yet, these same qualities make the Compendium of Birds an oddity of Qing court painting. It is far more comprehensive than other painted albums of birds, setting it apart from decorative works in the “flower and bird” genre. Moreover, it has an encyclopedic scope, including depictions of birds that are outside the traditional canon of auspicious animals depicted in Chinese painting. And finally, the systematic approach to classifying and describing bird species goes far beyond other works commissioned for the early Qing court. The unusual content and organization of the Compendium raises further questions that have not been addressed by previous scholars. Identifying each of the 360 species in this book, I discovered species that are not referenced in classical Chinese or early modern European ornithological texts. Moreover, using GIS mapping to link each of these birds to their real geographical ranges, I discovered that the specific birds included in this work were connected to the ecosystems of East Asia in a manner that suggests deeper links between natural history and Qing empire. The Compendium of Birds thus seems to relate to a broader program of imperial knowledge production, but its artistic and epistemic aims remain poorly understood. Why was it commissioned? How did it shape knowledge of the natural world? And how did the textual and painted representations of birds serve the interests of Kangxi and the Qing empire? Before examining these overarching questions about the Compendium of Birds, we must first examine the specific details of its creation and circulation. The original commission for the Compendium does not survive, but textual clues within the work itself suggest that it was completed around 1721. The first court record describing this work is the Qianlong Emperor’s catalogue of art in the imperial collection, the Precious Records of the Stone Moat (石渠寶笈, Shiqubaoji). Although it does not give a date of production, this catalogue states that a total of 360 illustrated birds were paired with descriptive texts by the scholar Wang Tubing (王圖炳, 1688-1743) and organized into twelve albums of thirty birds each. Unfortunately, this original version left the Palace collection in the early twentieth century and was sold, piecemeal, in Europe. However, selections from Jiang’s version that have surfaced in private collections seem to confirm this description. Each entry is characterized by a carefully articulated bird in a cropped landscape. Jiang is particularly attentive to representing the characteristic features of each species, especially the distinctive physiognomy of each bird and the coloration of its feathers. Fig. 1. Yu Sheng and Zhang Weibang, Yellow Parrot from Manual of Birds (鳥譜, niaopu), 1751. Ink and colors on silk, 41.2 x 43.9 cm. National Palace Museum, Taipei. Image in the public domain. In 1751, the Qianlong Emperor (r. 1735-1796) commissioned a copy of Jiang Tingxi’s Compendium of Birds that maintains the style and overall layout of the original (Fig. 1). A preface to this copy describes the emperor’s original commission, stating that the artists Zhang Weibang and Yu Sheng were ordered to copy Jiang’s original work. Like other “close copies” (摹本, moben), this facsimile was produced with a combination of tracing and side-by-side comparison. Comparing Jiang’s original with Zhang and Yu’s version shows that the copy accurately reproduces many features of its model. For example, the yellow parrot in both versions retains the same composition and overall color scheme; the bird is executed in delicate shades of pink, yellow, and white with a slightly bluish head. The feathers on the body are nearly identical, down to the number and arrangement of its tail feathers. This close reproduction also extends to the surrounding foliage, as the branches and cherry blossoms are nearly identical. The only differences are the addition of a few small leaves and a slight difference in the execution of the branches (especially the shading around the tree’s knots), which seem to show that these details were painted freehand. Because the complete text that accompanied Jiang’s paintings is lost, it is worth considering whether surviving copies preserve these original inscriptions. The entry for the Compendium of Birds in Precious Records of the Stone Moat states that the textual description for Jiang Tingxi’s original work was written by Wang Tubing, a poet and artist who seems to have specialized in natural themes: he also created an album of potted flowers called the Album of Poetry and Painting on Winter Scenes and Flowers (冬景花卉詩畫冊, Dongjinghuahui Shihuace). The few surviving inscriptions from Jiang Tingxi’s original version seem to match those in Qianlong’s official compendium, the Complete Library in Four Sections (四庫全書, siku quanshu), which in turn match the 1751 copy. But court records documenting the production of the Qianlong-era copy suggest that significant changes were made. Specifically, the 1751 edition includes a representation of the cassowary and new representations of female birds for some species that include inscriptions probably not written by Wang Tubing. Additionally, the original descriptive text in Chinese is accompanied by a word-for-word Manchu translation. Having reconstructed the original composition and appearance of the Compendium of Birds, I will now turn to its position within the broader program of imperially-commissioned natural histories at the Kangxi court. Historians such as Benjamin Elman have argued that works like the Compendium of Birds were part of the Kangxi Emperor’s (r. 1654-1722) strategy of knowledge production as a propagandistic tool. Kangxi saw how the production of the Great Compendium of the Yongle Reign (Yongle Dadian 永樂大典, 1403-1408) was used to support the legitimacy of the Ming dynasty and began similarly grand imperial publication projects to support his own political mandate. Over the course of his reign, Kangxi commissioned two monumental encyclopedias, entitled the Mirror of Origins Based on the Investigation of Things (格物致知, Gewuzhizhi) and the Synthesis of Books and Illustrations Past and Present (古今圖書集成, Gujin Tushujicheng), which were completed and published during the reign of his son, Yongzheng (r. 1723-1735). Intellectually speaking, these projects were connected to a broader trend of evidential research that aimed to contextualize and appropriate European science within existing Chinese models of scholarship. Scholars from the evidential (考證, kaozheng) school utilized an approach based in the rigorous and impartial examination of antique objects and classical texts to construct an empirical theory of knowledge. This approach was a critical part of Kangxi’s aim of organizing classical Chinese knowledge in his encyclopedia and compilation projects. But it can also be said that a similar methodology was adopted in imperially-commissioned Jesuit works at the Chinese court, which employed instrument-mediated observation and mensuration to create celestial and terrestrial maps as well as a perpetual calendar. This cross-cultural, evidential form of scholarship was an important element in the natural histories produced for the Kangxi court. Both of Kangxi’s encyclopedias included sections on plant, tree, bird, and insect species that drew upon numerous references to historical texts as well as direct observation. At the same time, Ferdinand Verbiest (南懷仁, 1623-1688), a Jesuit priest working within the Qing court, published two texts on natural history that used European sources to describe animals from Europe and the Americas. Despite the disparity of their respective models, these imperially-sanctioned texts share a similar means of describing each animal as if directly observed from nature. Kangxi effectively elided these diverse sources of knowledge within a single, unified imperial project. However, while scholars have shown how classical Chinese and European scientific writings were combined into a unified statement of Qing enterprise, the visual interpretation of this evidential approach to natural history remains poorly understood. Because representations of animals have a long history in both Chinese fine art and scientific texts, the problem is multifaceted: how do these paintings relate to the Chinese tradition of painting animals in fine art? How do they relate to illustrations from Chinese bestiaries and scientific texts? And how do they relate to illustrations in European models? Fig. 2. Huang Quan, Birds, Insects, and Turtles Sketched from Life (Xiesheng Zhenqin Tu 寫生珍禽圖 ), tenth century. Ink and colors on silk, 41.4 x 70.8 cm. Palace Museum, Beijing. Image courtesy of Palace Museum, Beijing. 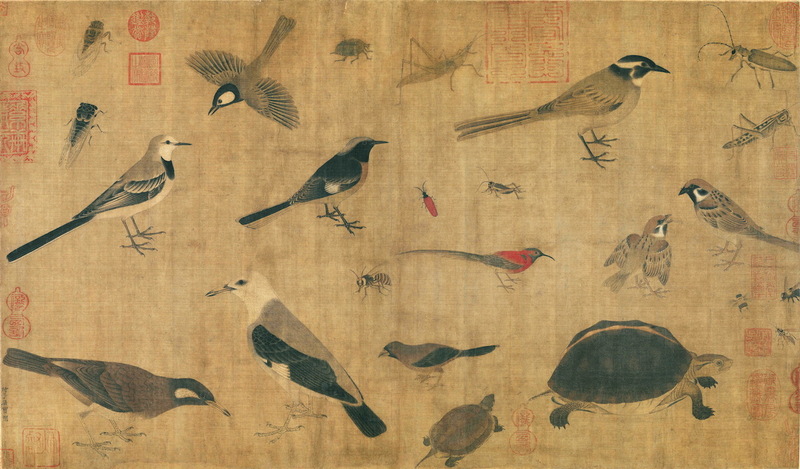 Birds have long been a subject of fascination in Chinese art. Accurate representations of specific species first emerged with the rise of “bird and flower” painting in the tenth century. For example, in Huang Quan’s (黃荃, 903-965) Birds, Insects, and Turtles Sketched from Life (Fig. 2), the artist rendered the body shape, plumage, and coloration of each animal so carefully that they can still be identified today. Consider the white wagtail (Motacilla alba), Daurian redstart (Phoenicurus auroreus), and Mrs. Gould’s sunbird (Aethopyga gouldiae), all common birds in the lowland forests of western China, where the artist lived. Fig. 3. Zhao Ji, Five Colored Parakeet (Wuse Yingge Tu, 五色鸚鵡圖 ), 1110s. Ink and colors on silk, 53.3 x 125.1 cm. Museum of Fine Arts, Boston. Image courtesy of Museum of Fine Arts, Boston. His body has all the colors of the rainbow, making him far from ordinary. This marvelous bird sticks out its tongue and speaks in a beautiful voice. When he flies to the treetops, he seems envied by all feathered creatures. When walking about, he is content, with a belly full of grain. His yellow breast and purple feet are truly elegant. So I compose this verse, following his footsteps and singing. The emperor explicitly compares the painting to its model, stating that the real bird is superior to its painted representation. And yet, this rhetorical approach still recognizes that painting, like the emperor’s descriptive poem, builds upon direct observation to convey the likeness of the original. 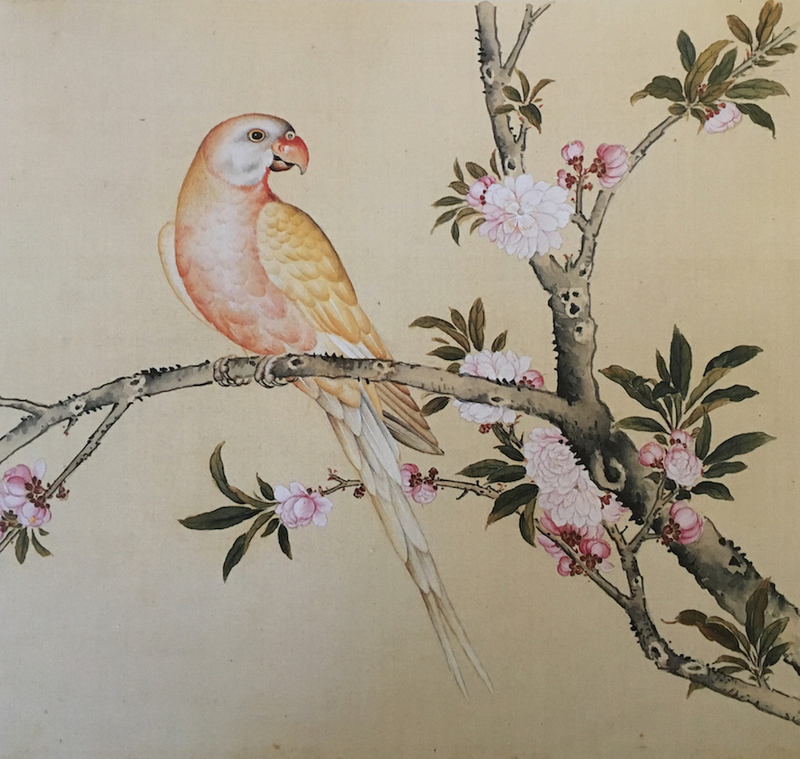 At the same time, Huizong explicitly notes the foreign origin of this parakeet, making it an early example of the relationship between exotic animals, gifts, and Chinese empire. Gifts of animals were often brought by ambassadors and foreign leaders who visited China during the formalized ritual events that comprised the so-called tribute system. Recent scholarship has shown that the forms of ritual changed dramatically over the course of the Qing. However, the normative idea of tribute as enshrined in Qing prescriptive manuals remained remarkably constant. In this conception, China sat at the cultural and geographic center of the world, with foreign countries arrayed in the four directions outside her borders. Because of China’s supreme cultural, political, military, and religious power, these foreign countries would send ambassadors bearing representative gifts to the emperor and offer allegiance to the throne. Receiving these gifts, the emperor would bestow presents in kind, sometimes even granting imperial titles to those with deep relationships to the Chinese state. The gifts brought by foreign countries were called tuchan 土產 – literally products of the earth or land. They needed clearly to represent the country from which they came, and were judged at the border before ambassadors were allowed to enter China. While exotic luxury goods such as jade, pearls, or gold were sometimes brought, animals and plants were especially valued as tribute gifts. For this reason, exotic animals and birds were often used in Chinese art as representations of foreign gifts and, by extension, foreign nations. In addition to Huizong’s parakeet, exotic animals and birds are depicted with foreign envoys in a range of paintings, stretching from Yan Liben’s (600-673) Tribute Bearers (職貢圖, Zhigong tu) to later Ming paintings such as Shen Du’s (沈度, 1357-1434) Auspicious Qilin (瑞應麒麟圖, Ruiying Qilin tu). In the Qing court, representations of tribute animals remained popular, and the Jesuit painter Giuseppe Castiglione (郎世寧, 1688-1766) produced stunningly accurate representations of foreign birds, dogs, and horses. Each of these paintings purported truthfully to record real animals received by the Chinese court, thus demonstrating the efficacy of the tribute system and Chinese foreign policy. Fig. 4. Wu Linfu “West of the Kaiming Beast that Guards Mount Kunlun” (showing phoenix, upper right) from Classic of Mountains and Seas (山海經, shanhaijing), 1597-1620. Printed book, 41.2 x 43.9 cm. Image in the public domain. The conception of these paintings as true representations of foreign creatures places these works in dialogue with Chinese natural histories and encyclopedias. Not only were birds described in textual sources such as the Classic of Birds (禽經, qinjing), they were also illustrated in popular books like the Classic of Mountains and Seas (山海經, shanhai jing) (Fig. 4). It describes an imaginary trip through the mountains and forests surrounding China, incorporating accounts of real animals with what Caroline Bynum Walker describes as paradoxology: a collection of portents, omens, and legendary creatures. Accordingly, the woodblock images that accompanied the Classic of Mountains and Seas were not understood as representations of individual animals like Huizong’s parakeet. Instead, they are part of a category of images called tu 圖 that convey deeper truths about animal species and natural spaces. Francesca Bray explains that tu are true embodiments of the world expressed in a static, visual form. “Tu,” she writes, “offered spatial encodings (often but not necessarily two-dimensional) of factual information, structures, processes and relationships, translating temporal or intellectual sequences into purely spatial terms, and encrypting dynamic processes as static layouts.” When these images were viewed, she argues, “the knowledge contained in the tu was unfolded into realisation and into action.” Thus, the tu diagrams in the Classic of Mountains and Seas should be understood as encoded illustrations of space. When viewed, a reader would virtually travel through these represented spaces, eliding the real and fantastic into a single unified narrative. But while these images purported to represent enduring truths about these exotic spaces and creatures, the truth of their claims was supported by the rhetorical force of the narrator rather than a documented program of observation, mapping, and illustration. This classical approach to visually encoding geography and natural history was complicated in the sixteenth century with the arrival of European Jesuits in China. As part of their overarching plan for establishing themselves as foreign experts, Jesuit missionaries introduced maps, celestial charts, perspectival rendering, and natural science to Chinese intellectuals. For maps and astronomical charts, surveying tools were utilized to produce images of the earth and heaven that went beyond subjective experience to present what Denis Cosgrove calls the “Apollonian gaze, which pulls diverse life on earth into a vision of unity.” The objective perfection of images, he argues, were utilized by proselytizing Jesuits to show the beauty and ineluctable certainty of God’s order. Jesuits in China used natural science to support the project of terrestrial mapping. Ferdinand Verbiest’s 1674 map of the world includes representations of exotic animals from foreign countries, each with a descriptive text outlining their country of origin and habits. These animals were copied directly from Conrad Gessner’s (1516-1565) encyclopedic zoology, Historia Animalium. At the same time, some artists in the Kangxi court attempted to copy the appearance of European hand-colored engravings from Conrad Gessner and John Jonston (1603-1675) in an album entitled the Manual of Sea Oddities (還怪圖, Haiguai Tu). Unlike the encoded, schematic animals in classical Chinese illustrations, early modern European natural histories used images to standardize and categorize nature. As Lorraine Daston and Peter Galison argue, eighteenth-century biologists built upon “sharp and sustained observation” of thousands of specimens, separating “accidental from essential features” to conceptualize and depict the enduring truth that underlay each species. These “typical” images were not truly objective; instead they represented the standardizing gaze of their authors, which separated, classified, and organized the biological world. The ordering gaze of eighteenth-century European scientific illustration was actively used as an instrument of empire. As Daniela Bleichmar has argued, natural history, especially botany, was used as part of Spain’s colonial enterprise in the Americas to visualize the spaces of Spanish empire and place the flora and fauna of these distant lands within the epistemic structures of European science. The standardizing gaze of scientific observation collapsed space and time, incorporating foreign ecosystems into a unified imperial program of political and economic control over Spain’s colonial holdings. Thus, representations of flowers, birds, and foreign peoples became instruments of imperial dominion. However, while this program of exploration, observation, and illustration was an effective tool of Spanish empire, it remains to be seen whether the Chinese court was using a similar approach in the Compendium of Birds. Jiang Tingxi and Wang Tubing were thus working with three distinct and potentially contradictory traditions of representing birds, attempting to fold them into a unified expression of Kangxi’s imperial project. Unlike the emperor’s two encyclopedias, here the division between European science and Chinese evidential learning could not be conveniently ignored. The book’s organization and content, as well as the visual style of its inscriptions, would place the Compendium of Birds in dialogue with each of these coexistent scholarly traditions, defining the emperor’s relationship to art, science, and the real spaces of Chinese empire. More than just a passive amalgamation of diverse traditions, I argue that the Compendium of Birds strategically adopted elements from Chinese and European sources to create a single, unified vision of Qing natural history. The organization and textual content of the Compendium of Birds is designed to evoke early Chinese ornithological texts while employing a European approach to taxonomy. Although the work has no prologue, the fact that the first bird in the Compendium is the phoenix makes this point explicit. The inscription notes that the early Confucian classic, the Dadai Li 大戴禮, states that “there are 360 feathered beasts and the phoenix is their ruler” (Appendix 1). Notably, this organizational structure was also used in the Classic of Birds, which positions the male phoenix and female huang birds as the rulers of 360 species of birds. Just two mythological birds, a phoenix and a luan, are included in the 360 species of the Compendium, positioning Kangxi’s ornithological project within the tradition of the Dadai Li and the Classic of Birds. This rhetorical alignment represents a real effort to position the Compendium as an extension of traditional Chinese learning. As Dagmar Schäfer notes, eighteenth-century Chinese scientific works often began with a superficial “lip service to established precedents,” even when these texts advanced arguments that were outside mainstream tradition. But the text of the Compendium engages with these precursors deeply, using them to quickly emplace each bird within an etymological, historical, poetic, and scientific context. Fig. 5. Yu Sheng and Zhang Weibang, A’lan / Oriental Skylark (Alauda gulgula) from Manual of Birds (鳥譜, niaopu), 1751. Ink and colors on silk, 41.2 x 43.9 cm. National Palace Museum, Taiwan. Image in the public domain. For example, the description of the a’lan (oriental skylark, Alauda gulgula) (Fig. 5) cites a range of classical scientific and literary works in a rough chronological order, beginning with an abecedarium from the first century BCE entitled Quickly Master [Character] Chapters (急就篇, Jijiupian), which describes this bird by name. Tracing the a’lan through a range of Tang dynasty sources, the text links the bird with the tumulus of Emperor Qin Shihuang in Xi’an. It cites the Anecdotes of Tang Poetry (唐詩紀事, tangshi jishi), which state that Emperor Minghuang (713-756) imitated its distinctive song with a jade flute. And it quotes the ninth-century poet Zhang Hu (張祜, 792-852), who wrote that the villagers in Xi’an would still play the song of the a’lan on their flutes. In addition to these literary sources, Jiang’s inscription also cites two early scientific sources: a twelfth-century herbal text entitled the Extension of the Material Medica (本草衍義, bencao yanyi ), and the Classic of Birds (禽經, Qinjing). The concise, densely referential structure of these inscriptions reads like a historical ledger. On one hand, the focus on etymology and history allows a reader to understand how each species was identified in various sources over the course of Chinese history. At the same time, the brusque, historiographical nature of the text downplays the deep poetic significance of birds like magpies, cuckoos, and cranes in Chinese, even as it notes their place within classical literature. In short, each species in the Compendium of Birds is firmly connected to a tradition of Chinese classical knowledge, but these literary sources are presented as systematically and objectively as possible, leaving poetic imagery and hyperbole behind. Fig. 6. Ferdinand Verbiest, World Map (坤與全圖, kunyu quantu), 1674. Print on paper, 141.5 x 143 cm. Image source: Wikipedia Commons. European science is not directly cited in the Compendium of Birds, with the notable exception of the entry on the turkey. Here Wang Tubing cites two seventeenth-century sources by the Jesuit Verbiest: the Illustrated Explanation of the World (坤輿圖說, Kunyu Tushuo), and the Records of the Greater World (坤輿外紀, Kunyu Waiji). Both texts link the turkey to Peru and Mexico, describing its appearance, breeding habits, and delicious flavor. These details closely follow the inscription on Verbiest’s world map (Fig. 6), which includes a turkey. At the same time, Wang Tubing’s inscriptions include a program of quantitative observation that closely resembles early modern European natural histories. Unlike earlier Chinese ornithological texts, each written entry begins with detailed measurements of each species that carefully note its coloration and distinctive characteristics (Appendix 1). These measurements were likely made from specimens collected in the field. This approach is identical to the observation-intensive method described by Daston and Galison above, identifying the “typical” features of each animal to divide birds into species and sub-species. Fig. 7. Yu Sheng and Zhang Weibang, Phoenix from Manual of Birds (鳥譜, niaopu), 1751. Ink and colors on silk, 41.2 x 43.9 cm. National Palace Museum, Taipei. Image in the public domain. The balance between classical Chinese and European models and methodology is mirrored in Jiang Tingxi’s illustrations. Importantly, the birds were not directly copied from European or Chinese natural histories. For example, the phoenix from the Compendium was not copied from the Classic of Mountains and Seas or any other Chinese text (Figs. 4 and 7). At the same time, the form, coloration, and visual style of the turkey is notably different from that included on Verbiest’s map (Figs. 8 and 9). 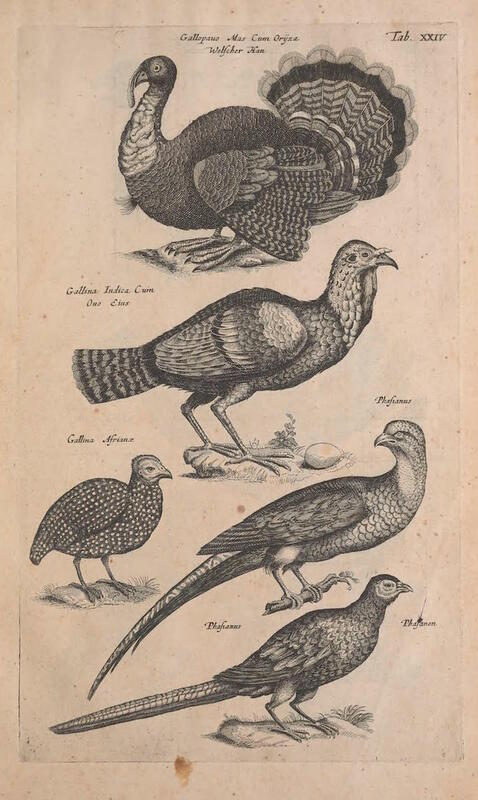 This is significant, as Verbiest’s turkey was directly copied from Ulisse Aldrovandi’s 1599 Ornithologiae (Fig. 10). In fact, Jiang’s turkey does not look like the male turkeys found in any of the European natural histories known to be circulating in the Qing court at that time, such as Conrad Gessner’s Historia Animalium (1551-1558) (Fig. 11) and John Jonston’s Historiae Naturalis (1599) (Fig. 12). And while its snood and wattle resemble those found on female turkeys in these European sources, the physiognomy, body stance, and feather pattern of Jiang’s turkey differs markedly from these models. Fig. 8. Detail of Fig. 6. Fig. 9. Yu Sheng and Zhang Weibang, Wild turkey (Meleagris gallopavo) from Manual of Birds (鳥譜, niaopu), 1751. Ink and colors on silk, 41.2 x 43.9 cm. Palace Museum, Beijing. Image courtesy of Palace Museum, Beijing. Instead, the visual qualities of these images seem to confirm that all the birds (except the two legendary beasts) were sketched from life. Rendering the plumage of each bird in delicate, fine lines and highly accurate colors, Jiang’s images are far more detailed than any earlier printed source. They go beyond the functional tu images in classical Chinese natural histories, just as they transcend the “typical” images in the natural histories of Gessner, Jonston, Aldrovandi, and Ray. In fact, Jiang Tingxi’s birds resemble nothing so much as Huizong’s five-colored parakeet. Fig. 10. Wild turkey (Meleagris gallopavo) from Ulisse Aldrovandi, Ornithologiae, hoc est, De alibis historian libra XII, 1599. Print on paper. Bologna: Francesco de Franceschi. Image in the public domain. The stylistic concordance between Chinese bird and flower painting and the Compendium of Birds is the key to understanding how the project of this album built upon its sources to create a powerful new vision of Qing empire. As we have seen, paintings of animals produced at the Chinese court were lasting records of tribute gifts given by foreign ambassadors. Adopting this visual style, Jiang Tingxi was deliberately associating each of these birds with the idea of tribute. Many of the birds, such as peacocks, hawks, eagles, and vultures, were almost certainly gifts from foreign nations, but the specific details of their arrival at court are not preserved. Fig. 11. Wild turkey (Meleagris gallopavo) from Conrad Gessner, Historia animalium, 1551-1558. Image in the public domain. The image of tribute has thus become the “typical” image. Placing each portrait-like image within the standardizing rhetorical project described above, each bird transcends the circumstances of its gifting, removing it from historical time. This approach marks an innovative improvement on traditional Chinese flower and bird painting at the imperial court. For while a painted representation of a tribute animal documents the successful execution of Chinese foreign policy, when tribute images become typical images, the successful implementation of Chinese foreign policy becomes the enduring standard. Fig. 12. Wild turkey (Meleagris gallopavo) from John Johnston, Historiae Naturalis de quadrupetibus libri, VI, 1599. Image in the public domain. At the same time, the “typical” image has become the image of tribute. Although collected and documented using a European approach, each of these animals is represented in the same visual style as tribute animals in Chinese painting. Birds collected from regions in and around China thus became emblematic of these regions, even when there was nobody to give these animals to the court. In many ways, this project is similar to the European colonial endeavor described by Bleichmar above, creating a collection of natural specimens from newly colonized areas to express imperial control over these territories. However, because tuchan were understood as gifts, this project had additional rhetorical force, implicitly arguing for the voluntary submission of the natural environment. Not only were ambassadors from foreign countries and disputed territories willingly presenting gifts to the Qing state, but through this imperially-sponsored collection process the birds were also effectively offering themselves as gifts to the court, bringing the natural spaces they represented into the Qing imperium through willing tribute, not conquest. If the bird species represented in the Compendium of Birds are emblematic of Qing dominion over the natural environment, the question remains: how do the species included in the manual reflect the actual geographical spaces of East Asia? Seeking to explore the connection between the Compendium of Birds and the geographical space of Qing empire, I have identified each of the 360 birds represented in the Compendium. Utilizing range data compiled by Birdlife International, which uses firsthand observation to monitor species’ migration patterns, I cross-referenced each of these species with the ecoregions of East Asia. More work is required to visualize the intellectual project of the complete album. But a preliminary analysis of the dataset provides tantalizing clues about the geographical ambitions of the Compendium of Birds. The data show that some of the species in the Compendium represent a wide range of East Asian ecoregions. Some, such as the oriental skylark (Alauda gulgula) considered above, are widely distributed across East Asia (Fig. 13). Others, like the golden pheasant (Chrysolophus pictus), inhabit the forests of China’s central plains, squarely within the boundaries of Ming China (Fig. 14). At the same time, the bearded vulture (Gypaetus barbatus) is only native to the high steppe of Inner Mongolia and Tibet (Fig. 15). And the common hill myna (Gracula religiosa) is only found in the jungles of Burma, Thailand, and northern India (Fig. 16). The inclusion of species from the borders of the Chinese empire suggests a focus on the geographical spaces of eighteenth-century imperial ambition. Kangxi had conquered Taiwan in 1687, Mongolia in 1697, and was working to draw Tibet more closely under Qing control. This project of border pacification and expansion was continued under Qianlong, who incorporated Tibet into the empire as a protectorate in 1751 and mounted unsuccessful military campaigns in Nepal and Burma. Fig. 13. Oriental Skylark (Alauda gulgula) range distribution map. BirdLife International and Handbook of the Birds of the World (2017), Bird species distribution maps of the world. Version 7.0. Courtesy of Birdlife International. Fig. 14. Golden pheasant (Chrysolophus pictus) range distribution map. BirdLife International and Handbook of the Birds of the World (2017), Bird species distribution maps of the world. Version 7.0. Courtesy of Birdlife International. Fig. 15. Bearded vulture (Gypaetus barbatus) range distribution map. BirdLife International and Handbook of the Birds of the World (2017), Bird species distribution maps of the world. Version 7.0. Courtesy of Birdlife International. Fig. 16. Common hill myna (Gracula religiosa) range distribution map. BirdLife International and Handbook of the Birds of the World (2017), Bird species distribution maps of the world. Version 7.0. Courtesy of Birdlife International. The Compendium’s inclusion of birds from these border regions suggests that their depiction may have been part of a larger intellectual project to incorporate contested geographies into the Qing imperium. The album thus drew upon multiple textual and artistic sources to create a work uniquely suited to the needs of the Kangxi court. European techniques of collection and observation created “typical” descriptions of species from border regions, even as detailed, Chinese-style representations of these species recast them as willing tribute. These two distinct traditions were united through both a textual project and a paratextual structure that connected the Compendium to classical Chinese sources. The result is a book that fits within a larger Qing ambition to unite seemingly disparate areas of knowledge under a single imperial voice. Within its pages, all birds – real, mythological, Chinese, and foreign – were emplaced within a standardized textual project and represented with a single artistic style. The Compendium of Birds touts Kangxi as the master of these birds and all they embodied with regards to history, poetry, tribute, and the real spaces of Qing empire. The phoenix is also called the ruiyan, the kunji, and the changli. The Erya (爾雅, Approaching the Correct) states that the huang is the female phoenix. The annotations further state that this auspicious bird has five colors, is approximately six feet tall. The Hanshi Waizhuan (韓詩外傳, Esoteric Traditions of the Han Version of the Songs) states that the appearance of a phoenix is as follows: its front looks like a goose, its back like a unicorn; its neck like a snake and tail like a fish; its [feathers] have patterns like a dragon and its back like a turtle; its chin is like a sparrow and its beak like a chicken. When it makes quiet noises, it sounds like gold; when making loud noises, it is like a drum. When it extends its neck or opens its wings, the five colors extend forth. The Shanhai Jing (山海經, Classic of Mountains and Seas) states that the Danxue mountains have [this] bird. It has five colors that form a pattern and is called the phoenix. It eats naturally, singing and dancing by itself. When it appears, all is peaceful under heaven. The Qinjing (禽經, Classic of Birds) states that there are five kinds of phoenix: the red one is called the danxue, the green one called the yuxiang, the white one is called huayi, the black yinzhu, the yellow one tufu. The Renjing (人鏡經, Classic of the Human Mirror) differentiates the five kinds of phoenix by place. The eastern one is faming, the western one is sushuang, the southern one is jiaoming, the northern one youchang, and the center is yuque. The Wulei zhi states that the phoenix is also called the ruiyan, and the kunji. When it gets old, it is called the changli. The Dadai Li (大戴禮, Dadai Record of Rites) states that the phoenix is the ruler of the 360 kinds of feathered beasts. The Kunyu Waiji (坤輿外紀, Records of the Greater World) states that Mexico has this chicken which is as big as a goose, with colorful feathers. It tastes good, except its head is poisonous and cannot be eaten. Above its lips is a waddle, which is flexible. When it contracts, it is no more than one cun and can extend up to approximately five cun. It can open its tail like a peacock. The Kunyu Tushuo (坤輿圖說, Illustrated Explanation of the World) states that Peru has a chicken larger than the normal chicken. Its head is relatively small. Above its beak is a waddle that is flexible. Normally, the beak is white, grey, or light green. When it gets angry, blood flows to the beak, making its color more beautiful. Its tail opens like a peacock. The feathers of the entire body are interspersed with black and white. When it gives birth, it does not feed its children. Thus, it needs people to help feed these chicks to survive. Acknowledgements: This article would not have been possible without the support of Wei Shang and the Department of East Asian Languages and Cultures at Columbia. I would also like to thank Journal18 for using a portion of their ARIAH digital development award to support my ongoing data visualization project, which will appear in the journal once it is finished. Many thanks to Katie Hornstein and my anonymous reviewers for their thoughtful critiques of this work. The character 譜 can be translated as album, manual, or record. The Palace Museum, Beijing and National Palace Museum, Taiwan translate this title as Manual of Birds, but I have opted for “compendium” to convey the scale of the project and distinguish it from other, smaller albums produced at court. This date is taken from an inscription in the manual on the “old vulture” (老皂雕, lao zaodiao), or cinereous vulture (Aegypius monachus) that is dated 1721. See Zhang Zhao, Shiqu Baoji San Bian (石渠寳笈三編, Records of the Stone Moat), Juan 44: 41. The reverse of this image, like all surviving examples, contains an album and a page number. These numbers coincide with the pagination of the 1751 copy discussed below. High quality images of Jiang’s Compendium of Birds are difficult to find, as they are all in private collections. The image attached here was sold by a French consulting firm, Cabinet Portier. Poor lighting makes this image look more yellow than it should, although it is certainly possible that the silk in Jiang’s album has yellowed slightly with age. Note the yellowing at the bottom left corner of the image. The record states that Wang composed the text for Yu Sheng’s version, but he died in 1743, eight years before the copy was completed. Although the relevant record for Jiang Tingxi’s version does not name an author, Wang was probably responsible for this text. See Lai Yu-chih, “Tuxiang, zhishi yu diguo: Qinggong de shihuoji tuhui 圖像, 知識與帝國：清宮的食火雞圖繪,” The National Palace Museum Research Quarterly 29:2 (2011), 32-33. More work needs to be done to compare the two versions of this text. The translations included below were based on the text from the Complete Library in Four Sections, which seems to reflect Wang Tubing’s original text. More work is needed to systematically analyze the differences between the Kangxi-era original texts and the edited Qianlong versions. See Benjamin A. Elman, On Their Own Terms: Science in China, 1550-1900 (Cambridge, Mass. : Harvard University Press, 2005), 237. Here, 異 can also mean foreign. Here, 遐陬 xiazou explicitly references foreign nations and is used in contrast to 九重 jiuchong, the interior of the emperor’s palace. 五色 wuse literally means “five colors,” but it also signifies all of the colors in traditional Chinese thought. See John King Fairbank, “A Preliminary Framework,” in The Chinese World Order; Traditional China’s Foreign Relations, ed. Fairbank and Ta-tuan Ch’en (Cambridge, MA: Harvard University Press, 1968), 12. See Macabe Keliher, “The Manchu Transformation of Li: Ritual, Politics, and Law in the Making of Qing China, 1631-1690,” (Phd diss., Harvard University, 2015), 227. For an overview of guest ritual, see Evelyn S. Rawski, The Last Emperors: A Social History of Qing Imperial Institutions (Berkeley: University of California Press, 1996), 201. For the relevant eighteenth-century prescriptive records, see Yintao胤祹, Qin Ding Da Qing Hui Dian (Qianlong Chao) 欽定大清會典: [100 Juan], 24 vols. (China: s.n., 1764), Juan 56. For an post-structuralist conception of tribute ritual and gift giving as a transformative act, see James Louis Hevia, Cherishing Men from Afar: Qing Guest Ritual and the Macartney Embassy of 1793 (Durham: Duke University Press, 1995). See John E. Wills, Embassies and Illusions: Dutch and Portuguese Envoys to Kang-Hsi, 1666-1687, Harvard East Asian Monographs (Cambridge, Mass. : Council on East Asian Studies, Harvard University, 1984), 53. For a catalogue of Castiglione’s animal paintings, see Cécile Beurdeley, Michel Beurdeley, and Giuseppe Castiglione, Giuseppe Castiglione: A Jesuit Painter at the Court of the Chinese Emperors (London: Lund Humphries, 1972). Probably compiled in the Qin dynasty (221-206 BCE), the Classic of Mountains and Seas was edited and republished in succeeding dynasties; the earliest surviving illustrated version dates from 1597. See Richard Strassberg, A Chinese Bestiary: Strange Creatures from the Pathways through Mountains and Seas (Berkeley: University of California Press, 2002), 22. Caroline Walker Bynum, “Wonder,” The American Historical Review 102:1 (February 1997), 12. Francesca Bray, “Introduction: The Powers of Tu,” in Graphics and Text in the Production of Technical Knowledge in China: The Warp and the Weft, Vera Dorofeeva-Lichtmann and Georges Mrofeeva-Licht (Leiden; Boston: Brill, 2007), 2-3. See Nicolas Standaert, SJ, “Jesuit Corporate Culture as Shaped by the Chinese,” in The Jesuits and the Arts, 1540-1773, ed. John W. O’Malley, Gauvin A. Bailey, and Giovanni Sale (Philadelphia: Saint Joseph’s University Press, 2005). Denis E. Cosgrove, Apollo’s Eye: A Cartographic Genealogy of the Earth in the Western Imagination (Baltimore: Johns Hopkins University Press, 2001), x. See Daniel M. Greenberg, “Weird Science: European Origins of the Fantastic Creatures in the Qing Court Painting, the Manual of Sea Oddities,” in The Zoomorphic Imagination in Chinese Art,ed. Jerome Silbergeld and Eugene Wang (Honolulu: University of Hawai’i Press, 2015). Lorraine Daston and Peter Galison, Objectivity (New York: Zone Books, 2010), 58-59. Daniela Bleichmar, Visible Empire: Botanical Expeditions and Visual Culture in the Hispanic Enlightenment (Chicago: University of Chicago Press, 2012), 6-10. Dagmar Schäfer, Cultures of Knowledge: Technology in Chinese History (Leiden: Brill, 2011), 212-213. Like the Compendium of Birds, the Classic of Birds also has 360 species of birds which are ruled by two sovereign birds: the phoenix and the huang. The taxonomical structure used in the Classic of Birds may have been an important source for the Compendium of Birds, and warrants further research. Lai Yu-chi has shown that the description of the cassowary is built upon a deep engagement with a range of eighteenth-century European natural histories. However, this bird was added to the 1751 edition and was not part of Jiang Tingxi’s original Compendium. See Lai, “Tuxiang, zhishi yu diguo,” 18-24. The rhea, bird-of-paradise, and toucan are also included on Gessner’s map, but they are not directly cited in the Compendium. The rhea and toucan are absent from Jiang’s compendium (although the cassowary is related to the rhea and may be related to the Qianlong-era copy). The bird-of-paradise cites Chinese, not European sources. The original commission for Jiang Tingxi’s version of the Compendium of Birds is lost, but Lai Yu-chih notes that Qianlong ordered Qing officials to collect bird specimens for the creation of the 1751 edition. See Lai, “Tuxiang, zhishi yu diguo,” 32-33. This was the only image of a turkey in Jiang Tingxi’s version, but the Qianlong-era version of the Compendium of Birds identifies this as a male, pairing it with a second image of a female that is strikingly different from all European sources and almost certainly modeled from life. Lai argues that the realistic appearance of the phoenix and luan was designed to imbue these legendary birds with the same epistemic status of real birds. See Lai, “Tuxiang, zhishi yu diguo,” 29. The data within the Birdlife database correspond to present-day ranges, but there is strong reason to believe that these ranges have remained largely constant with the ranges of each species in the Compendium of Birds. While bird species move across geographical terrain, they are often bounded by their ecoregion. That is, bird species indigenous to the jungles of Burma probably did not relocate to the temperate forests of Sichuan or the northwestern steppe, and vice versa. For an introduction to East Asian ecoregions, see Eric Dinerstein, David Olson et. al., “An Ecoregion-based Approach to Protecting Half the Terrestrial Realm,” BioScience 67:6 (June 2017), 535-545. The results of this will be added as a digital supplement to this article once it is completed. This project is ongoing and complicated by the richness of the Birdlife data. Many of the species included in the manual have multiple ranges (breeding, migrating, and resident), and some have multiple subspecies, varieties, and subpopulations. This data will need to be aggregated and systematically cross-referenced with East Asian ecoregions to see if the intellectual project of the Compendium is evenly spread across East Asia or focused on border region. 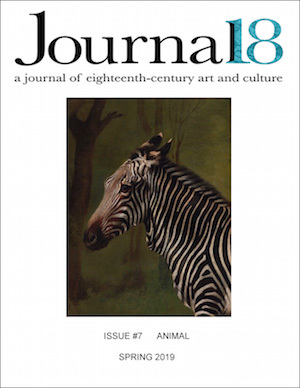 Cite this as: Daniel M. Greenberg, “Taxonomy of Empire: The Compendium of Birds as an Epistemic and Ecological Representation of Qing China,” Journal18, Issue 7 Animals (Spring 2019), http://www.journal18.org/3710.